Lt. Gen Nadja West will be honored February 10, 2016 in an official ceremony formalizing her promotion to three-star general, making her the first African American woman to achieve that rank in the United States Army. She is also the highest-ranking woman of any race to have graduated from West Point, according to reports. Late last year, the 54-year-old military leader was confirmed by the Senate as the new Army surgeon general and commanding general of the U.S. Army Medical Command (MEDCOM). In that post, West assists and advises the secretary of the army and army chief of staff on healthcare matters in the military branch, and oversees development, organization, policy direction, and other initiatives related to the army’s healthcare systems. 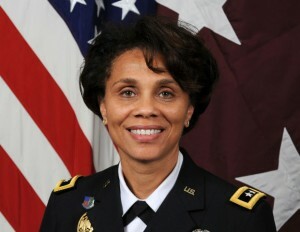 West was also the first army officer to hold a leadership role at the National Naval Medical Center, a top-tier center in Bethesda, Maryland, where she served as a deputy commander. West’s military career includes deployments during Operations Desert Shield and Desert Storm, and she was part of a medical mission with the 5th Special Forces Group. She has held command at two army medical centers, as well as the Europe Regional Medical Command. She has also served as joint staff surgeon at the Pentagon. She has other previous assignments as commander of Womack Army Medical Center in Fort Bragg, N.C., and division surgeon, 1st Armored Division, Army Europe and Seventh Army, Germany. An alumna of the United States Military Academy at West Point and George Washington University School of Medicine, she holds a bachelor’s of science degree in engineering and a doctorate degree of medicine.